Running Time: 2 hr. 23 min. During the latter half of Skyfall, Judi Dench’s M, testifying before a bureaucratic inquest declares that today’s true threats to safety and security are “individuals, not nations.” Punctuated by a passage from Tennyson’s Ulysses, the expertly edited scene plays like a commentary on our post-bin Laden world. However, the megalomaniac or terrorist-led organization was always the central villain throughout Ian Fleming’s James Bond books and the now-50 years of films they spawned, unlike most of Fleming’s Cold War spy novel counterparts. It’s an allusion that’s likely intentional, for Skyfall is steeped in a nostalgia for cinema’s most enduring series. The indomitable iconography of the Bond films continues to make every new release an event. However, here it serves a more fundamental function. Whereas Casino Royale was a reboot of the Bond franchise, this represents a restoration. Opening with a mistaken demise that harks back to You Only Live Twice, death and rebirth are the film’s overarching themes. Bond (Daniel Craig), a neurotic who word-associates “murder” with “employment” and “woman” with “provocatrix,” uses pills and drink to self-medicate demons dating back to some unresolved childhood trauma. He’s also a relic in the age of cyberterrorism where, to quote his new quartermaster (Ben Whishaw), “I can do more damage on my laptop sitting in my pajamas before my first cup of Earl Grey than you can do in a year in the field.” Meanwhile, M is a lioness in winter, on the eve of forced retirement after a computer list of undercover NATO spies is stolen and slowly leaked online. Beginning with the hunt for a disposable henchman that leads to bedding a disposal Bond girl, Skyfall tracks the familiar tropes. It also teeters on the tedium of the Brosnan years until the arrive of Raoul Silva (Javier Bardem), once M’s favorite MI6 agent given up for dead, but now resurrected as a cyberterrorist burdened with a facial prosthetic and single-minded desire for reprisal against his former minder. Ernst Blofeld is the most iconic Bond villain, but Silva is the most demonic, a devilish dandy that suggests a blond-haired Anton Chigurh with charisma. Trying to off M is bad enough, but it takes pure evil to go out of your way to destroy Bond’s Aston Martin DBS. The supporting cast also includes Ralph Fiennes as an intelligence overseer and Albert Finney as Kincaide, the gamekeeper at Bond’s titular family estate. But the real stars of Skyfall are Craig, Bardem and cinematographer Roger Deakins. While still the portrait of brooding intensity, Craig also shows a relaxed and more self-assured side, much like Sean Connery’s evolution as Bond from Dr. No through Thunderball. Deakins, the nine-time Oscar nominee, takes a Bond movie and makes a visual spectacle, from a rooftop motorcycle chase through Istanbul to the neon silhouettes atop a Shanghai skyscraper to a lantern-lit flotilla in Macau to the cold blue hues of a decaying pastoral manse (by way of Surrey, England). In its eagerness for homage, Skyfall makes a bigger jumble of the Bond timeline (particularly a film-ending reveal). However, chronological purity goes out the window once you accept a protagonist who never ages, even over 50 years. The biggest quibble is that, despite a number of memorable scenes and plot turns, the screenplay from Oscar nominee John Logan plus Bond regulars Neal Purvis and Robert Wade isn’t tightly organized or particularly subversive beyond Bardem’s Silva. The spiritual three-way between Bond, Silva and M is teased out but never consummated to its delicious potential. 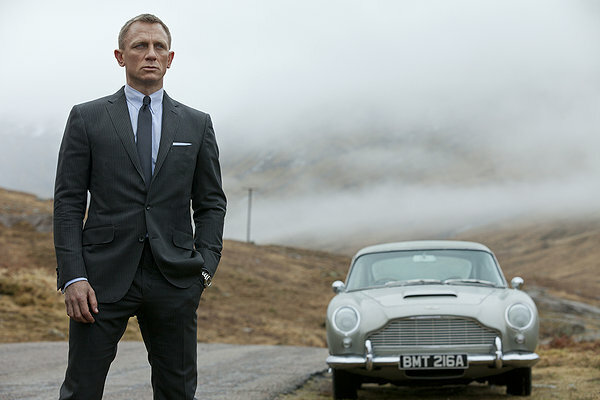 Moreover, Skyfall could have dovetailed off Casino Royale to further redefine James Bond. Instead, it settles for reintroducing him. Anyway, welcome back, old friend.